Winner of the tennis industry’s award for “Most Innovative Tennis Event of the Year,” the United States Tennis Congress (USTC) is our flagship event. 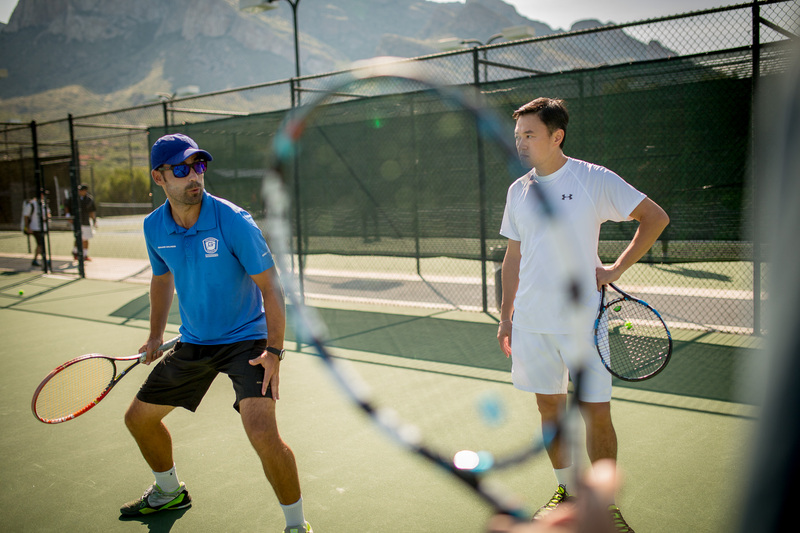 Held every two years, the USTC gives passionate adults (low-intermediate NTRP 3.0 through high-performance NTRP 5.0) access to world-class training usually reserved only for top juniors and professionals. We invite you to join fellow tennis fanatics and 80 master professionals, Grand Slam legends, physical conditioning coaches and sport psychology experts, and equipment gurus from all around the world for a uniquely fun and inspiring experience covering all aspects of training necessary to improve your game– on and off the court. * 14.5 Hours of Customized On-Court Assessment and Training (4.75-5 Hours per Day): We will create a customized schedule just for you, featuring multiple small-group training sessions each day (4:1 coach-to-athlete ratio) built around on your level and the objectives you identify in advance. Drawing from the elite ranks of renowned teaching professionals as well as the international tennis tour, where we’ve recruited some of the most accomplished Grand Slam champions, coaches, tour players, and Davis Cup participants, you will have the opportunity to work under the close guidance of approximately six to eight coaches with unique and proven expertise in the areas you have prioritized. * 10 Hours of Elective Specialized Off-Court Workshops (3+ Hours per Day): Because success in tennis is about more than hitting a good ball, we offer you a wide variety of off-court class options each day with world-renowned experts on topics ranging from strategy, mental conditioning, fitness, nutrition, and equipment to supplement your core training plan. * Your own Personal “Head Coach”: To help you process and apply all that you’re learning during the event, you’ll be matched up with a personal Head Coach at the start of the Congress. Each afternoon, you’ll have a 2-hour practice session with your Head Coach and three other athletes at your level, which will provide opportunities to practice and implement ideas from specialized classes in a supportive setting. On the final day, your Head Coach will help you prioritize post-Congress goal-setting and action steps. * Lifetime access to the TC “Alumni Hub”: Once you attend any Tennis Congress event, you are part of our alumni community for life. All alumni will gain to our new community private site so you can stay in touch and continue conversations with fellow athletes and faculty– plus connect with fellow passionate players and coaches in our international network when you’re traveling. You’ll also be able to access a reference library archive housing presentation materials, “homework,” and videos connected to classes at the Congress. 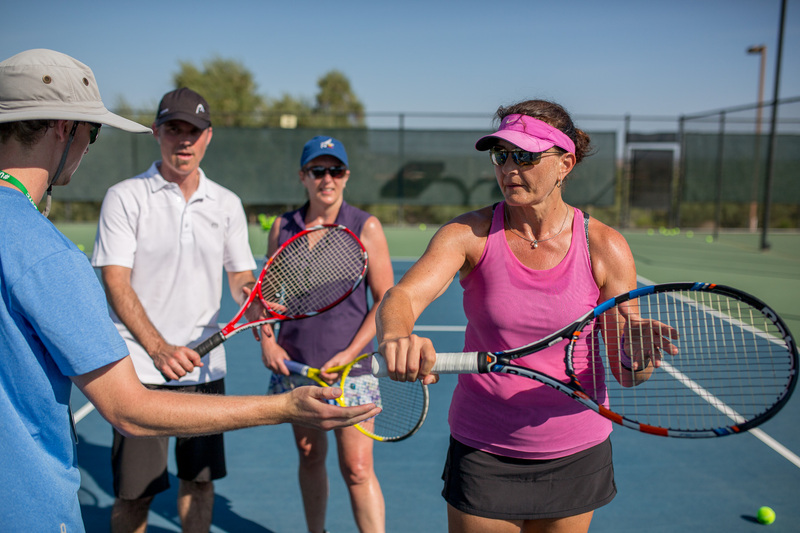 * All Meals and Special Evening Programs: The sessions may be intense, but once the racquets go back in the bag it’s time to relax, recharge, and socialize with your new tennis friends. The 2019 program includes dinner on Thursday-Sunday nights as well as breakfast and lunch Friday-Sunday. We also have a number of group activities planned to keep the fun going! The full program cost for the 2019 Tennis Congress is $2,595, which includes all customized on-court classes, off-court elective workshops, plus all meals and special activities. 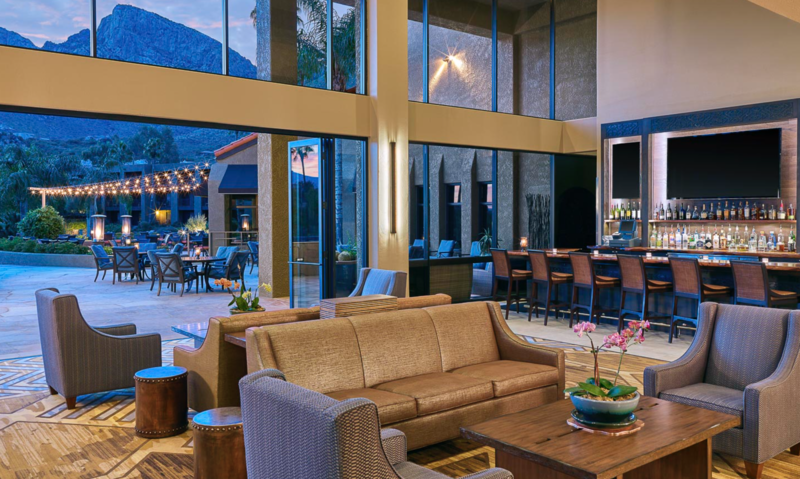 Registered participants are eligible for a special discounted $169/night room rate at the Hilton El Conquistador, a AAA Four Diamond Resort in warm, sunny Tucson, Arizona. The Extended Program Coached Match Play Option (Monday 8am-Noon), limited to 56 athletes on a first-come basis following registration, is an additional $595. 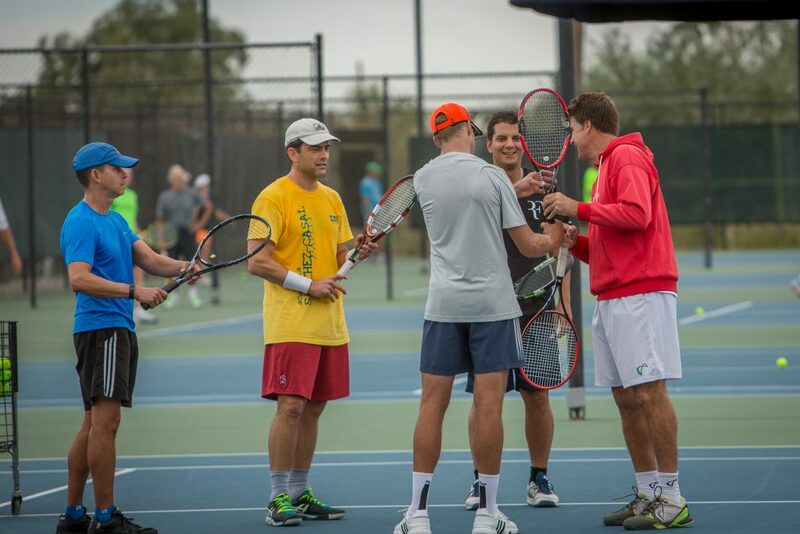 The 2019 Tennis Congress is all about you – with a unique format that lets you tailor classes to your specific needs and learn under the guidance of world-class professionals, coaches, and sports specialists. The program is designed to help you train smarter and to apply what you learn to practices, private lessons, clinics, and camps when you return home. After you register, we’ll send you a detailed questionnaire asking you to assess your game and indicate the top-priority areas you want to focus on at the Congress. Your answers will directly influence the final curriculum and determine which classes we ultimately offer. Our faculty experts will also use your feedback to design sessions that address your specific interests, questions, and challenges – and build on the core competencies they believe are most critical to help players unlock progress at every stage of their development. About 10 weeks before the Congress opens, you will be asked to indicate any changes in your priorities. 7-10 days before the event, you will receive your customized on-court schedule along with a list of all the elective offerings you will be able to choose from to supplement your on-court training. We look forward to helping you unlock your full potential at the 2019 Tennis Congress! Customized classes are carefully built for individual participants based on their level and stated priorities. They are all held on-court in small groups, with 4 students per court. Students indicate preferences prior to the Congress, including for specific faculty members, and we do our best to match you with the right students and pros. Topics will be developed based on participants’ interests expressed in detailed surveys following registration. Elective classes are designed to supplement on-court tackle topics through group learning and demonstration. These are mainly held indoors at the resort’s conference center to enable the use of audiovisual and other teaching tools and to facilitate discussion. The formats vary depending on the topic: some are best suited to lectures or expert panels involving multimedia, others (e.g. mental game) rely heavily on group discussion, others (e.g. footwork or fitness classes) involve movement and are physically demanding. Some use a “demonstration” format, others are highly participatory. 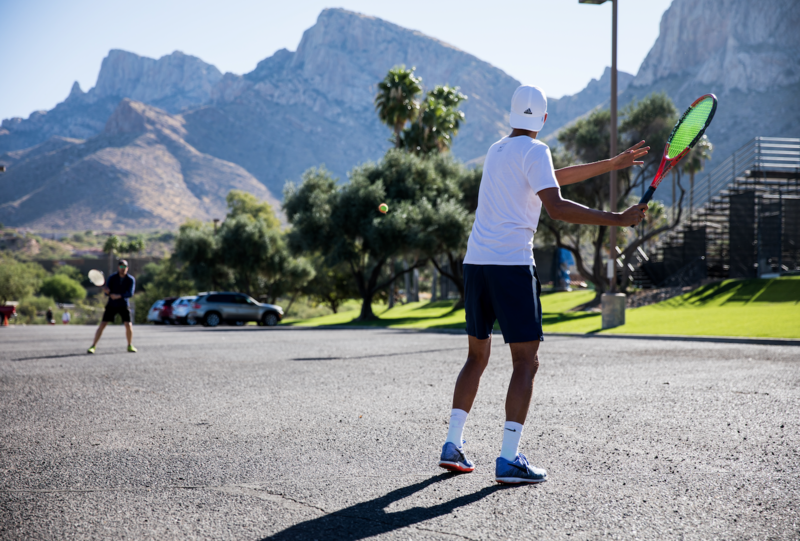 Located on over 500 acres in the shadows of the magnificent Pusch Ridge in Tucson, Arizona, the Hilton Tucson El Conquistador Tennis & Golf Resort offers some of the most pristine desert and mountain vistas in the Southwest. In 2012 the Hilton Tucson El Conquistador received USTA’s award for Outstanding Tennis Facility of the Year. It is Southern Arizona’s largest tennis resort, and host to numerous prestigious national level USTA events for both adults and juniors. 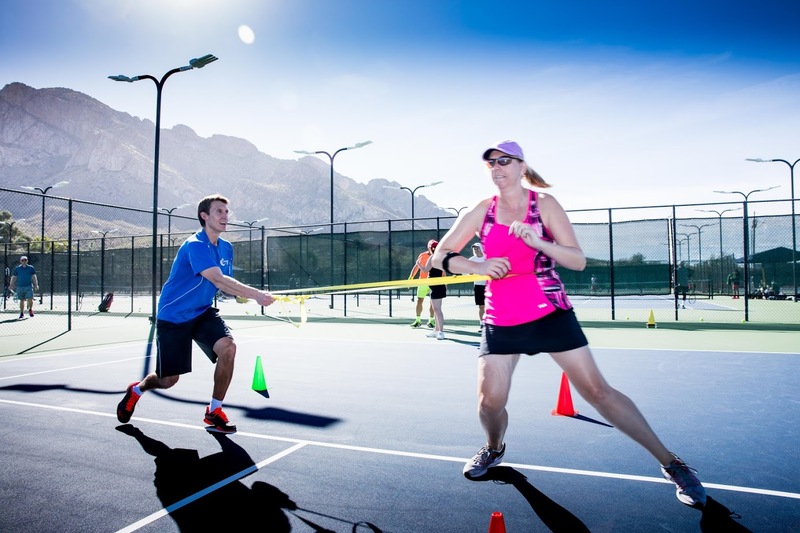 The Resort boasts 31 beautifully lighted courts, two full-service pro shops, offering a variety of tennis attire, shoes, and accessories, as well as 24-hour turnaround stringing services. The Resort’s elegant guest rooms and suite accommodations offer spectacular views of the mountains, pool, city views or desert landscape. The property has been awarded the prestigious AAA 4-Diamond rating 27 years in a row. 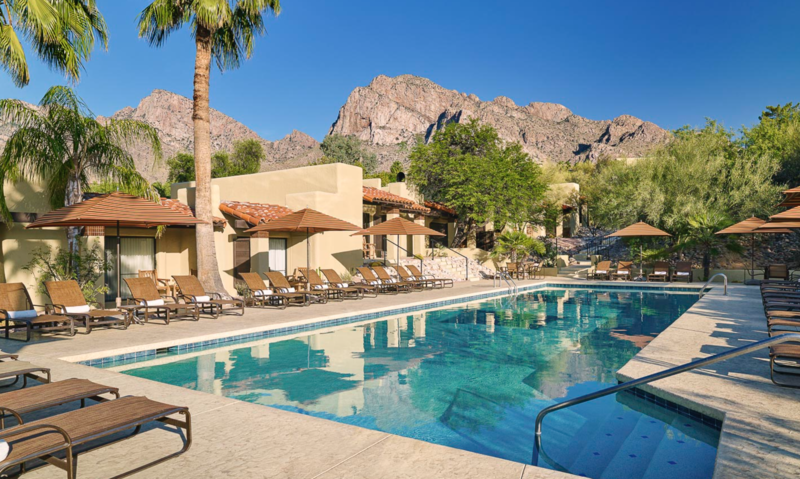 Nestled at the base of the breathtaking Santa Catalina mountains and surrounded by acres of high Sonoran Desert terrain, the resort offers an opportunity for guests to experience world-class resort amenities in a truly spectacular setting. Registered participants are eligible for a special discounted $169/night room rate–also valid 3 days prior and 3 days after the Congress. 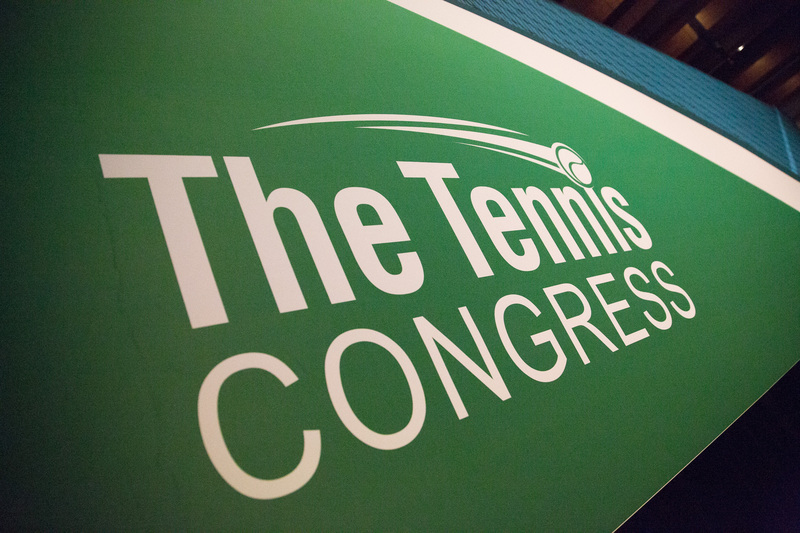 WHO SHOULD ATTEND THE TENNIS CONGRESS? 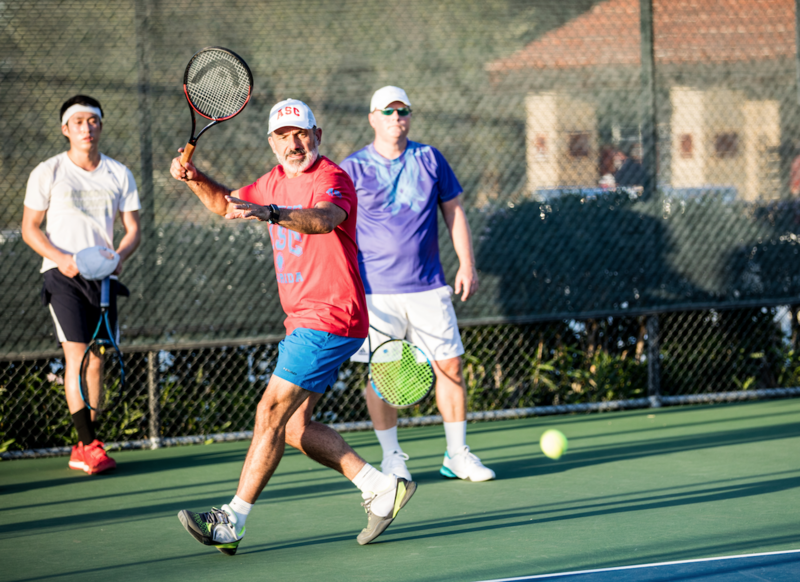 The United States Tennis Congress is designed for adult players from Low-Intermediate (NTRP 3.0/ITN 7) to Advanced/High Performance (NTRP 5.0+/ ITN 3) who are passionate about learning and taking their game to the next level. 21 years old. We are planning future Congress events for adults who want to train alongside mature juniors who are also training hard… stay tuned! WILL I HAVE FUN IF I COME ALONE? Yes! Don’t worry, we’ll make sure you meet others quickly who make you feel totally welcome. We’ll pair you up with one of our Alumni Ambassadors, who will reach out to you in advance, greet you when you arrive, and introduce you to several alumni on the first day so you feel totally welcome. CAN YOU GROUP ME IN CLASSES WITH MY SPOUSE, PARTNER, FRIENDS? Yes, if you are at the same playing ability and share similar priorities. You can indicate this on the detailed profile form we send you after you register, on which we’ll ask if you want us to arrange all your customized classes together (even if it means sacrificing some of your individual priorities), or if you’d be happy with having some classes together so we can tailor classes to each of you. We generally recommend the latter. CAN I CHOOSE MY INSTRUCTORS? For your on-court customized classes, we will work hard to match you with the faculty members who are most expert in the priority areas you indicate — as well as to match you with any specific faculty members you request. We can’t guarantee you’ll be placed with any specific faculty member(s), but we can guarantee that we will do our very best to accommodate as many requests as possible. CAN MY NON-PLAYING SPOUSE OR PARTNER JOIN ME FOR MEALS? Yes! After you register, we will send you options. There is no extra charge to have a spouse/friend in your hotel room. There is a guest fee for receptions, meals and dinner programs – your spouse/friend can purchase passes to selected meals/events or all of them. DOES THE PROGRAM FEE INCLUDE MY HOTEL ROOM? No, this is so you have the option of arriving or departing a little earlier or later to enjoy the Hilton El Conquistador resort at the special negotiated rate Congress rate of $169/night (which includes the resort fee). When you register we’ll send you details on how to reserve your room at this exclusive rate for Congress participants, valid 3 days before and after the event. We understand that sometimes “life happens” with unexpected circumstances and emergencies. However, we also hope you understand that due to the highly customized nature of the Tennis Congress experience, late cancellations have serious implications for our planning and budgeting. For this reason we have the following refund policy in place: Before June 30, your program fee is refundable less a $250 cancellation charge. From July 1-August 18, your program fee is refundable less a $400 cancellation charge. From August 19-September 15, your program fee is 50% refundable. You may transfer (i.e. sell or gift) your program to another player (3.0-5.0 NTRP level) with no cancellation charge if you notify us and put us in touch with your designate by August 19 so we can factor them into the planning and build their customized schedule. Between August 19-October 6, you may transfer (i.e. sell or gift) your program to an appropriate player at or above your playing ability who is willing to do the exact program we have created for you with no cancellation charge. If your team qualifies for a USTA Nationals championship on the same weekend as the event, we will provide a 100% refund with no cancellation charge if we are notified by August 19. If you become injured and decide to opt out of on-court classes but still attend the Congress and take advantage of the many off-court offerings, we will refund 50% of your program fee. You can fly either into the Tucson AZ airport (TUS), which is about a 30 minutes drive from the Congress site at the Hilton El Conquistador Resort or the Phoenix AZ airport (PHX), which is about 90 minutes drive. If you fly into Tucson, you can rent a car or take advantage of the Hilton’s inexpensive transportation service offered to participants. We will contact you during the summer with the full range of available options for ground transportation both from Tucson and Phoenix. DO YOU OFFER SCHOLARSHIPS FOR THOSE WHO CAN'T AFFORD TO ATTEND? Yes, we award several full and partial tuition scholarships each year through a competitive application process. Click here for instructions and application form. Application deadline: July 1. You may transfer (i.e. sell or gift) your program to another player (3.0-5.0 NTRP level) with no cancellation charge if you notify us and put us in touch with your designate before August 19 so we can factor them into the planning and build their customized schedule. From August 19-October 6, you may transfer your program to an appropriate player at or above your playing ability who is willing to do the exact program we have created for you with no cancellation charge if you notify us and put us in touch with your designate by October 6. One of the many advantages of doing the Congress in Tucson in October is the very low chance of prolonged rain. In the event of intermittent showers, outdoor classes will stay strictly on schedule (to keep all 500+ customized classes on track) and students and coaches will “huddle” in dry areas and continue working together as effectively as possible until the rain passes. In the highly unlikely event of prolonged rain, the organizers will do their best to ensure athletes and their coaches get as much court time as possible.